In this paper we examine the importance of migrant stocks on FDI flows from a sample of 19 developed countries to around 150 partner countries using a modified version of the gravity model. Based on recent advances in the modelling of trade using the gravity model we include a variety of fixed effects to control for various sources of endogeneity and deal with the issue of many zero and negative values of FDI. We further adopt an instrumental variables approach to deal with potential simultaneity. 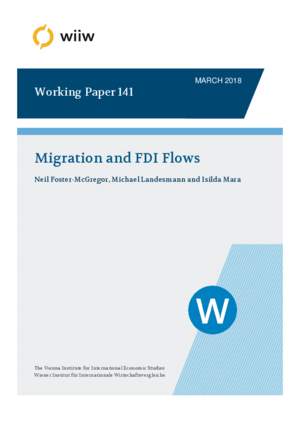 Results suggest that migrant stocks are positively associated with higher FDI inflows and outflows, with the effects working largely by enhancing the strength of existing FDI relationships rather than developing new relationships. We find little evidence of heterogeneous effects by skill level of the migrants.